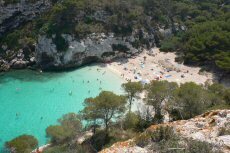 The Cala Macarelleta is situated just near Cala Macarella at the south of the island. The beach can be reach only by walk or by sea. This is a wonderful beach with few people.